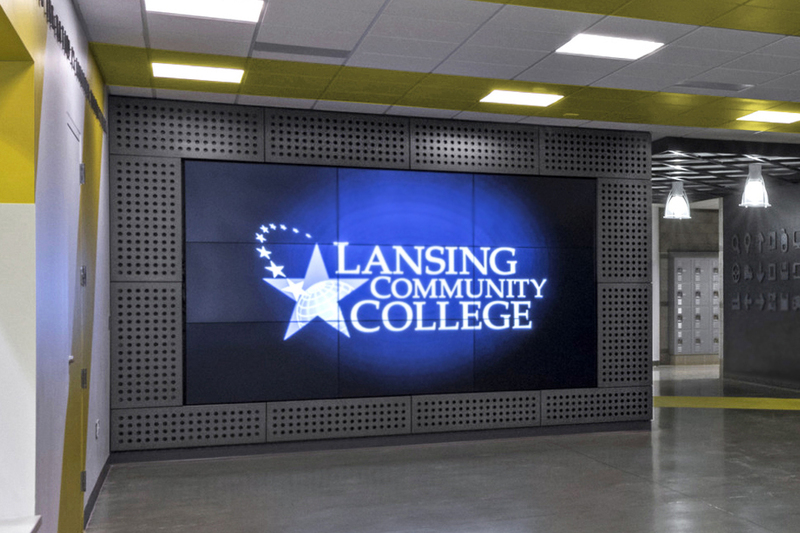 Lansing Community College asked us to help them turn their new state-of-the-art Center for Manufacturing Excellence (CME) into a place that would attract and inspire students. Their new CME houses the most modern, cutting-edge equipment and robotics available. The equipment is similar to what their students can expect to find in the world’s leading manufacturing facilities. 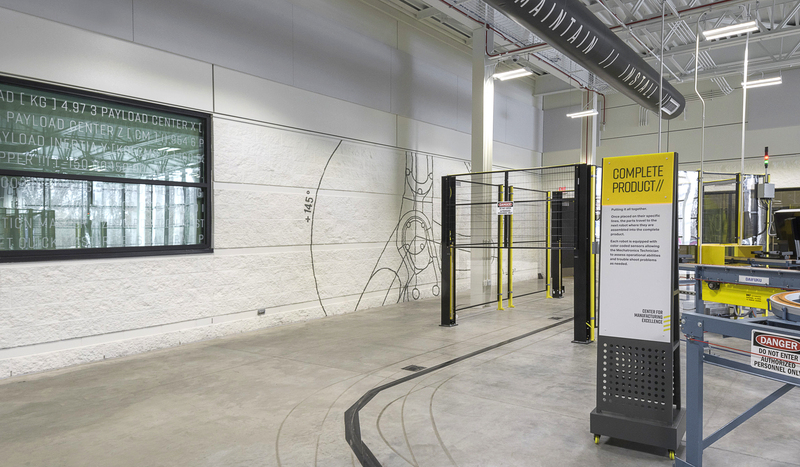 With the aid of this equipment, the school trains students for careers in advanced automation. 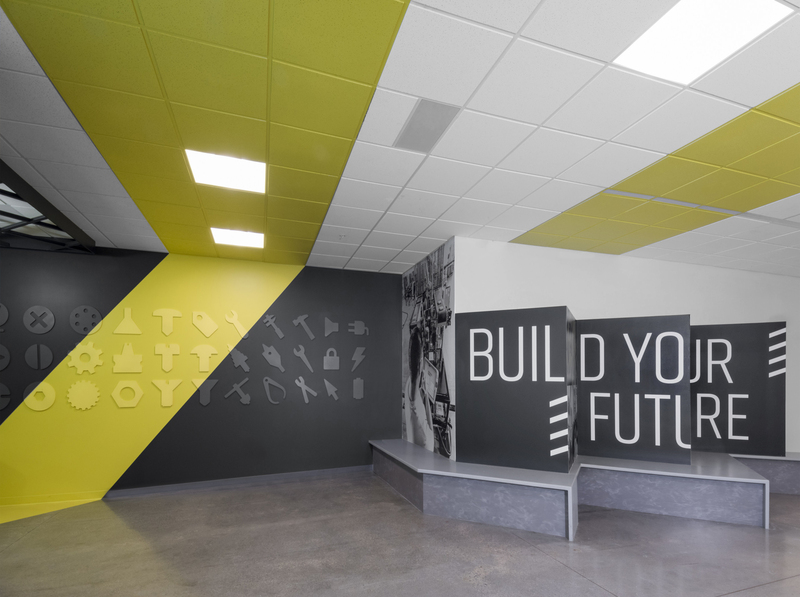 Ideation’s objective was to inspire prospective students as they moved through the space. We wanted students to see and believe that working in manufacturing could be a cool career with great pay and that Lansing Community College would be a great place to start. This was a placemaking project focused on turning a facility into a place people wanted to belong to. As students enter the building, we wanted them to recognize that the space is highly-specialized and designed specifically for them. We also wanted them to see and believe that manufacturing is both sophisticated and modern. To achieve this, we used several different design elements. Oversized, yellow safety striping typically found on plant floors. Larger than life images of real people handling advanced technology. The use of metal as well as dark, warm gray colors and finishes that look like steel. First, we designed and fabricated metal panels to frame a digital display wall in the main lobby area. The panels were engineered to be installed with no visible hardware but allow for easy removal when the displays needed servicing. The perforation pattern we used is a design element throughout the space. 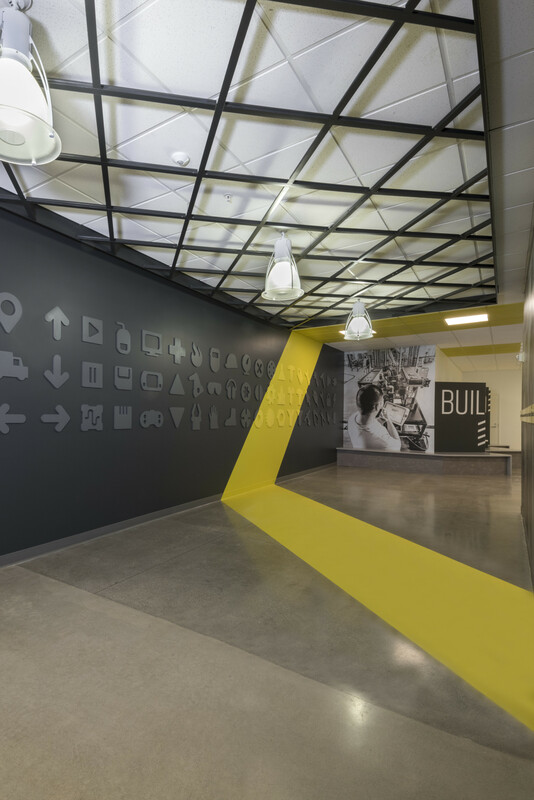 When Harley Ellis Devereaux designed the architecture for the space, the firm included unique features that presented us with some interesting environmental graphic design opportunities. Here, we communicated “BUILD YOUR FUTURE” on an “accordion wall” near the entrance to greet prospective students and welcome back the enrolled. This was one of just a few simple, powerful messages communicated in the space. 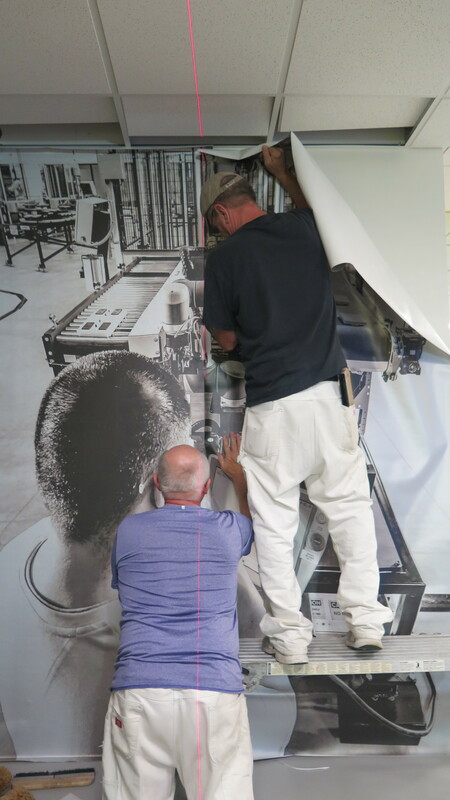 Next, larger-than-life murals of young people working in advanced manufacturing environments brought future careers to life. We printed murals on wall coverings with a metallic steel texture. In this mural, our main character uses a tablet-style computer; technology students were familiar with. 66 unique industrial icons were designed to create an art piece that connects the video gaming culture many prospective students come from, with a technological future. 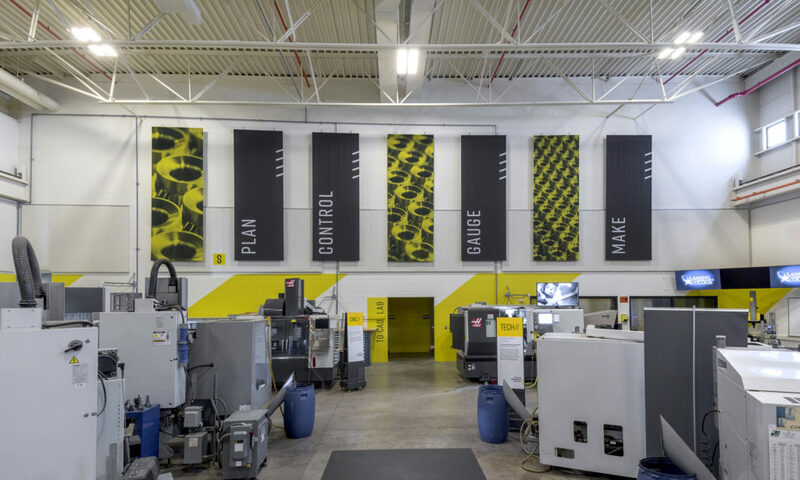 Inside the manufacturing space, we wanted to bring focused energy and excitement to an environment that seems both complicated and visually chaotic. We did this in a very simple, but cost-effective way, with building blocks of painted wall striping, spare bold messages, and fabric banners. The large scale of (7) 14’ tall vertical banners spaced 37” apart made a big impression while communicating order and precision. 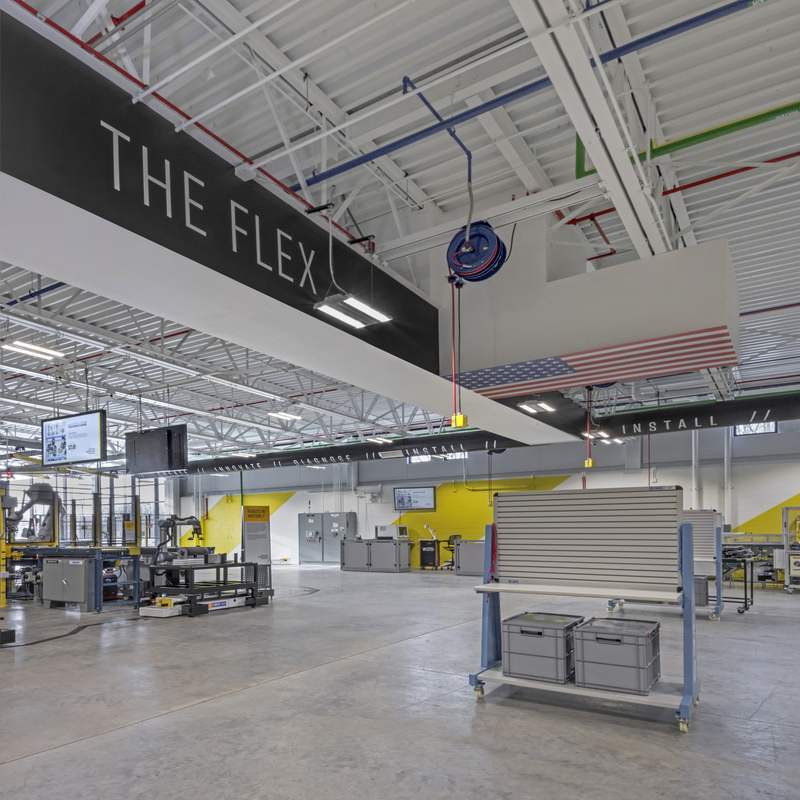 We branded the space that housed the fully-automated robotic assembly line known as a Flexible Manufacturing Unit as “The Flex.” The American flag featured throughout the space promotes pride in advanced American manufacturing. Here we painted the flag on the ceiling. Plant safety is always a top concern in manufacturing. Here we used another simple, but powerful, statement while continuing to brand the space with bold colors. While robotics play a big role in manufacturing, so do people. 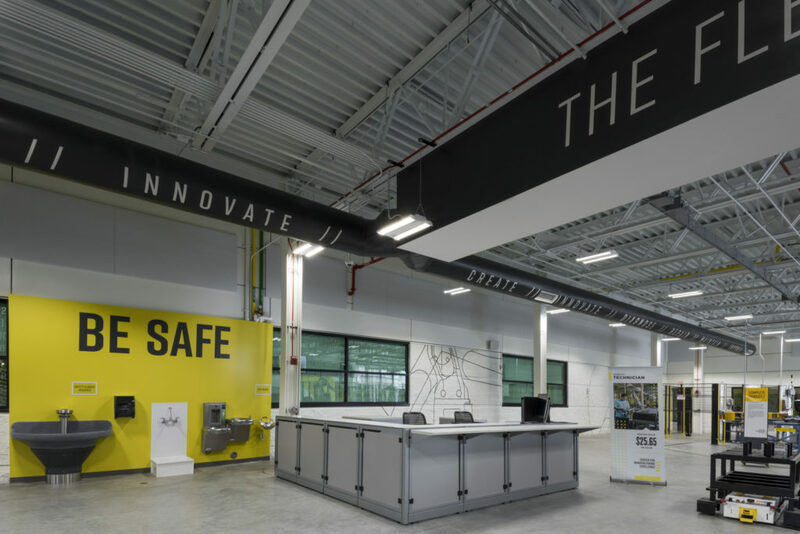 We painted the words “Innovate, Create, Diagnose, Install, Repair, Maintain” on the overhead ducts to call out the role of a modern manufacturing specialist. Finally, a series of custom-designed mobile pylons communicated the stages of manufacturing in the Flex. Getting from design concepts to installation involved a lot of details. Left: A prototype of the perforated panel to surround the digital display wall in the lobby ensured an optimal fit as well as an installation that would involve no visible fasteners. Right: The CME lobby sign, fabricated from aluminum, wrapped a wall after we bent it 90-degrees. We routed the logo out of .25” thick aluminum and painted with high-gloss yellow. Custom fabricated pylons featured neon yellow acrylic. 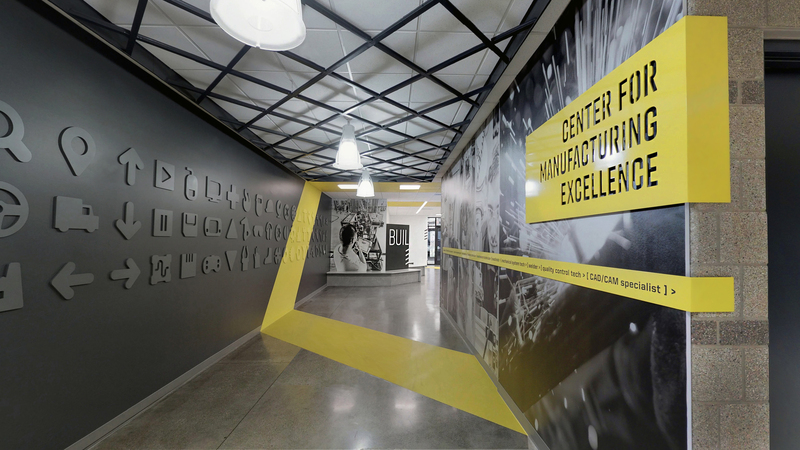 We also incorporated the Center for Manufacturing Excellence brand. 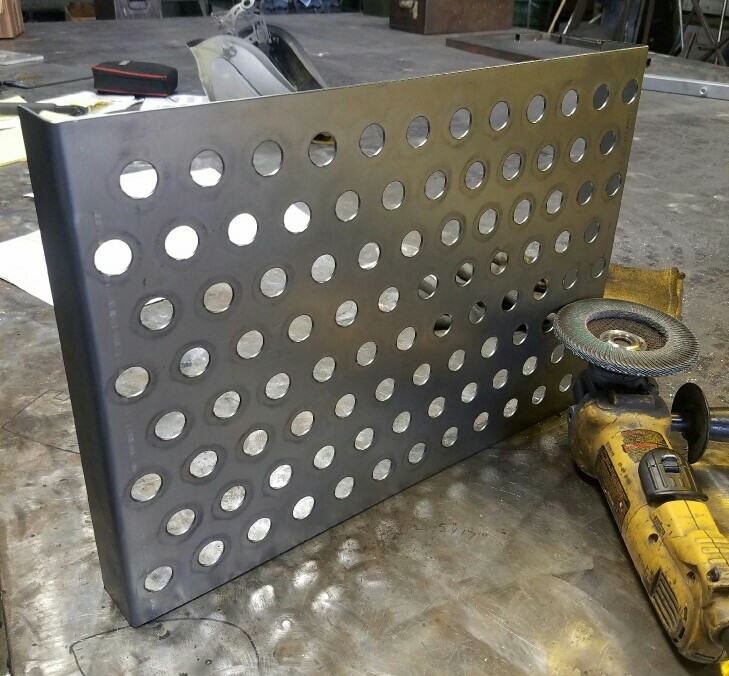 The metal base incorporated the same straight row perforation pattern used as a design element throughout. We cut and applied code from the student’s robotics manual to the window using a frosted vinyl. Fabrication of the surround to the digital display wall in progress. We achieved installation of custom-printed wall coverings with the aid of laser marking and leveling. 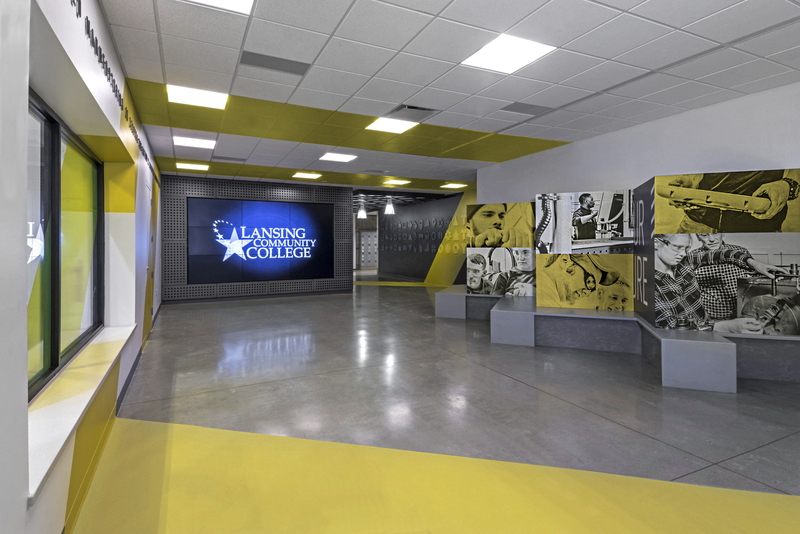 “LCC has been highly involved in ambient learning and creating visually appealing spaces throughout our campuses. 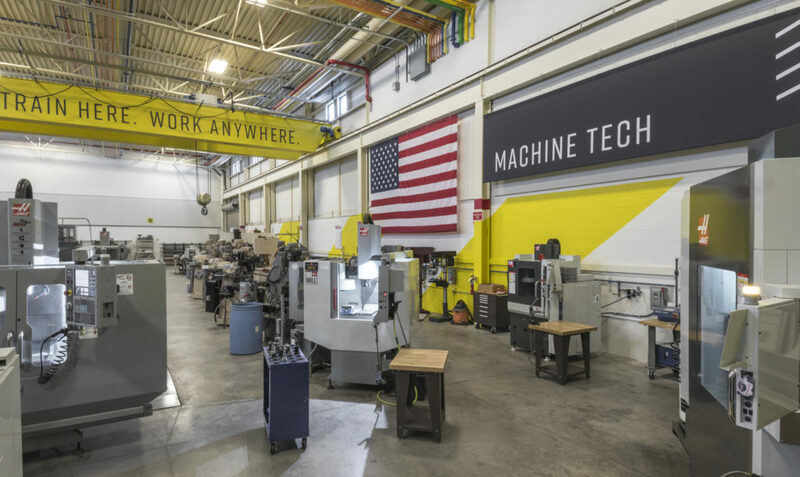 So when we decided to add a robotics lab and create the Center for Manufacturing Excellence (CME) we knew we needed it to be outstanding in design. 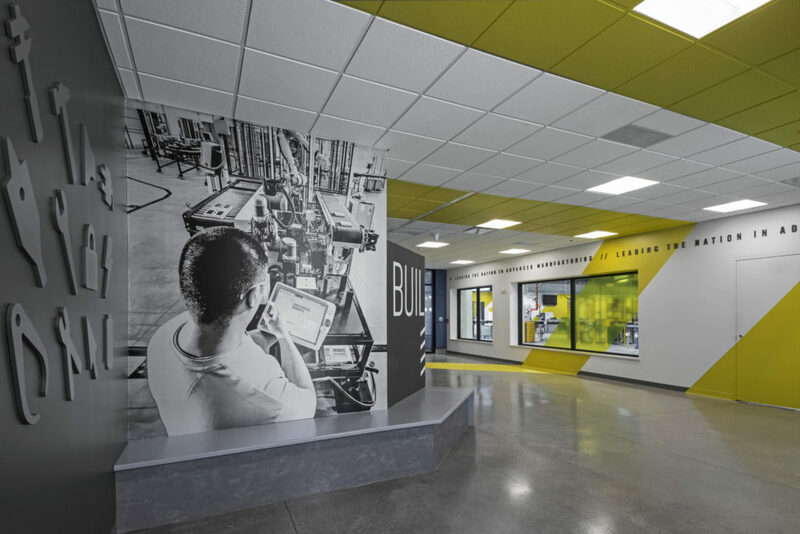 We wanted the spaces to express the feeling of what new cutting-edge manufacturing facilities look like, while also inspiring and educating students. Plus we wished to include a bit of fun and flare. Ideation delivered all of this on point. Their team truly made the spaces connect and they were mindful in delivering timeless design features. Students want to be in the spaces now, they are collaborating and staying on campus. It’s exactly what we had envisioned and hoped for. Additionally, other visitors including legislators, teachers and community leaders are blown away by our facility and its design.